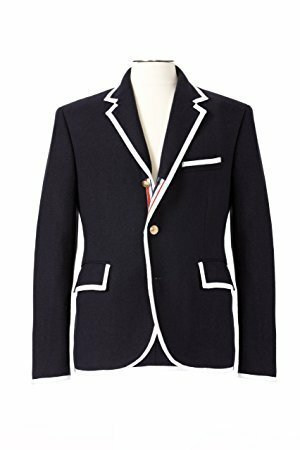 Contrast ribbing trims this classic Thom Browne men's blazer, complete with golden anchor buttons and signature striped details. Size is Medium Wool (exclusive of decoration); polyester/rayon lining. Imported. Contrast ribbed trim; Thom Brown signature striped lining; golden buttons with anchor detail. Notched lapels with striped ribbon at back; two-button front. Chest welt pocket; front flap pockets; three inside pockets. Darted front; dual vents.Long sleeves with functional button cuffs.